Did you know there’s an easy change you can make in your account that will often dramatically improve email delivery rates for your volunteers? Because Volgistics sends messages to recipients on your behalf, sometimes these messages are viewed as suspect by target email domains. This is especially true for CCed email addresses. And from time to time, it can abruptly become a major issue in response to internal changes made by certain email providers. Emails sent from your account will suddenly begin to get rejected. But there are measures you can take to help your messages get through more reliably. All of these measures are found on your account’s Messages Ground Rules setup page. The first, easiest, and most valuable step you can take is to configure your account to use the recommended message settings: to let Volgistics handle Sender ID, and to use VolunteerMail@volgistics.com as the from address. Volunteers will still reply to you, and are unlikely to notice any difference, but this can drastically reduce the likelihood that your messages are rejected. You can learn more about this in the “Volgistics Account Settings” section of Help Topic 2046. If your organization strongly prefers to handle their own Sender ID and/or use their own from address, an alternative solution is to add Volgistics’ IP Addresses to your organization’s email service. This is especially important when attempting to contact recipients who have email addresses from your organization’s own domain. You can learn more about this in the “Network or Provider Settings” section of Help Topic 2046. Another option that is always advisable is to encourage your volunteers to add Volgistics’ sending email addresses to their “safe sender list” so that their email providers are instructed to trust messages that you send them through your Volgistics account. You can learn more about this in the “Volunteer and Coordinator Settings” section of Help Topic 2046. Please keep in mind that even after following these steps, you’ll need to manually “Reset” the email addresses of any volunteers that have already been marked as invalid (red). This will make it so that the system continues to try to send them messages that are addressed to them, instead of skipping them when messages are sent. One of the stock Schedule Reports available in Volgistics is the Schedule Statistics (Stock) report. This report is useful because it allows you to quickly see how many openings are filled and un-filled for each assignment. Plus you can get an unduplicated volunteer count for how many volunteers are scheduled for the assignment. Select Print from the Menu. Click the “Clone it” button. This “spins off” a copy of the report with the same settings as the stock report. You can change the settings on the Options tab to cover a different time period. You can also save the modified report so you do not need to create it again. Why Create an Engagement Strategy? Keeping Your Team on the Same Page: An established strategy for your recruitment and retention efforts makes the process clear for everyone involved. When someone has a question, they don’t have to guess. Instead, they can reference your plan. Affirming the Value of Your Volunteers: Many organizations couldn’t make their current impact without their volunteers. Yet many organizations don’t include volunteers in their strategic plans. Acknowledging your volunteers’ importance can completely change your approach to organizing. Saving You Time: Increased volunteer retention gives you time that you would normally spend on recruitment. You also don’t have to think about what to do next to bring people in — you already have it written down. Helping You Find the Best Fits for Your Organization: An engagement strategy geared towards your organization’s needs and values will attract more volunteers who care about what they do. As a bonus, a well-designed plan will keep these people around. Giving Volunteers a Consistent Experience: When your team uses the same methods to keep volunteers around, you look more professional and cohesive to the volunteers you work with. This reliability builds their trust and respect. Of course, an engagement strategy also offers the perk of dedicated volunteers if you create one that resonates. However, doing so can be easier said than done. The following tips will help your plan succeed and help you keep volunteers coming back. Before you think of ways to engage your volunteers, you have to know their skills and values. Volunteering has a selfless nature, but that doesn’t mean you shouldn’t consider creating a beneficial experience for your volunteers. While employees receive compensation in exchange for their work, volunteers don’t make a living off of their endeavors. This means that they can leave whenever they want if they don’t find helping you fulfilling. 1. How Do Your Volunteers’ Values Match the Organization’s Values? The experience you offer your volunteers could tap into values that your organization doesn’t focus on. For example, some volunteers for Christian organizations don’t consider themselves Christian. Instead, they volunteer because they enjoy helping people. 2. Where Do Your Volunteers Excel? They might gravitate towards certain positions over others. If you know where your volunteers thrive, you can look for people with similar passions. 3. Why Do People Volunteer Here? Volunteering offers so many perks besides fulfillment. Some people help organizations to meet new people and socialize. Others want to build experience for their career or personal growth. 4. What Kind of Schedule Do Your Volunteers Typically Have? Stay-at-home parents, salary workers, and retirees all have different windows of availability. You need to honor your existing volunteers’ time commitments while recruiting for time slots that need coverage. Use this information to create a profile of your most dedicated volunteer. When you create the rest of your strategy, you will keep this person at the front of your mind. Many organizations have multiple kinds of volunteers to profile, so consider the differences between the subgroups in your volunteer base. Some types of volunteer management software let you create sets of volunteers with specific traits. Use this feature to pinpoint who stays involved and who leaves. In some cases, you may want to recruit people who have an entirely different profile from your current volunteers. Make a profile of the volunteer you have in mind to guide your recruitment activities just as you would with an existing volunteer. What kind of help do I need from this volunteer? Who will give the volunteer directions and guidance? Will the volunteer have multiple duties or do the same task? How many hours a week will I need this volunteer? You should especially focus on making accurate time estimates. When you ask for a time commitment, expect no more from the volunteer unless you request it well in advance. Your volunteer has other commitments in their life. Plus, you don’t seem trustworthy when you promise two hours and ask someone to stay for three at the last minute. Volunteer scheduling tools let you set a schedule and communicate about it. You and your volunteer will know as soon as possible when either of your expectations changes. A report in the Stanford Social Innovation Review examined why volunteers quit. Two of the five most common reasons involve a lack of recognition. Some volunteers leave because they don’t receive the same acknowledgments as donors. Others quit because the organization doesn’t even think about their value. They put work into the organization’s cause, but that work doesn’t get noticed. Now that you have a way to report the difference your volunteers make, let everyone involved in the organization know. Include their achievements in annual reports, social media posts, newsletter, and other regular communications. Sharing what they do with the entire organization sends the message that their contributions have as much importance as paid work. Host a get-together entirely focused on your volunteers. No fundraising, no training — just something they can enjoy. Whether you take them out to dinner or have a full-on gala, they’ll look forward to it every year. Send a card to their home showing your gratitude for helping at an event or simply doing what they do. If you have the budget and a small enough crew, you could even include a small gift card to a cafe or restaurant. However, don’t underestimate the impression a note can make on its own. You can also manage birthdays in a database and send cards out every month. Even just stopping by during your volunteers’ shifts to personally thank them can make a difference. Visit during a normal day of volunteering, so they know you think about them. These gestures shouldn’t depend on the volunteer’s results and hours worked. Every contribution, no matter how big or small, should receive gratitude. After all, they all take time out of their day to help your organization succeed. Some milestones call for celebration. Motivate your volunteers to hang in there by rewarding their dedication. Incentives like awards for a certain number of service hours demonstrate that you appreciate their loyalty. Volunteer management software makes tracking award benchmarks easier than ever. For example, you can define awards based on hours of service, and the program will mark volunteers who qualify. Even if you don’t base your awards on service hours, you can note which ones a volunteer receives for easy reference. Assigning Teams: Putting volunteers into specialized groups gives them an opportunity to get familiar with each other. Getting on Social Media: Social media platforms offer plenty of opportunities to connect. Online groups and communities let you and your volunteers share updates and get to know each other. They also help members who don’t usually work together build relationships. Throwing Events: Host get-togethers that have the sole purpose of helping volunteers socialize. Even something as small as a pizza party can get the conversation flowing. The extra morale boost from an event’s fun activities doesn’t hurt either. Noting Your Volunteers’ Areas of Interest: Take a minute to ask your volunteers what they want to get out of their experience and where they thrive. Even adding a field on your application or having each volunteer complete an interest form will give you vital information. Volunteer database labels will help you categorize each volunteer by their talents. Assigning Tasks Based on Individual Skills: Once you know where your volunteers succeed, give them work that uses their gifts. For example, if someone loves social media, have them create posts or manage your page. Many volunteer management software systems have features that match talents to positions. Creating Opportunities for Leadership: Give your volunteers as much autonomy as you can make room for. Let them take ownership of their projects and do something they feel proud of, not something you micromanage. An Intensive Orientation Program: You don’t want to scare off recruits with a large time commitment for their initial training. Yet they need to get something out of it to feel prepared instead of overwhelmed. Find ways to make volunteer orientation enlightening without wasting your team’s time. Ongoing Training: Once your volunteers finish orientation, don’t leave them figuring out the rest. Provide regular trainings that teach them skills that matter. Bring in Guest Speakers: Invite industry professionals to talk about important topics in your field. Let them take over training for a day, or host an event where interested volunteers can learn something new. Host Informal Seminars and Classes: If you have the resources to hold voluntary skills-building workshops, why not try them out? Your volunteers will learn ideas that you know they feel passionate about. Invest in Learning Through Experience: Smaller organizations might not have the capacity to provide the previous amenities to their volunteers. If you can’t manage to set aside resources for dedicated learning events, putting extra effort into mentoring volunteers can work just as well. Check in frequently with them and ask them where they want to succeed. Frequency: Remember to send your team regular updates, but don’t bombard them with messages. Relevancy: Who needs to know what you have to say? Your fundraising team doesn’t necessarily need to hear about updates from the marketing team. Volunteers who live a few hours away probably can’t cover a last-minute shortage. Only send messages to people who need to hear them. Consent: Does a volunteer want to receive messages in the first place? Get their permission before you send emails and texts. Even if your team must see these communications to do their duties, you have to let them know. Flexibility: Make it simple for a volunteer to opt in or out of any type of message. Their preferences could change in the future and letting them change their message settings themselves is easier for everyone. 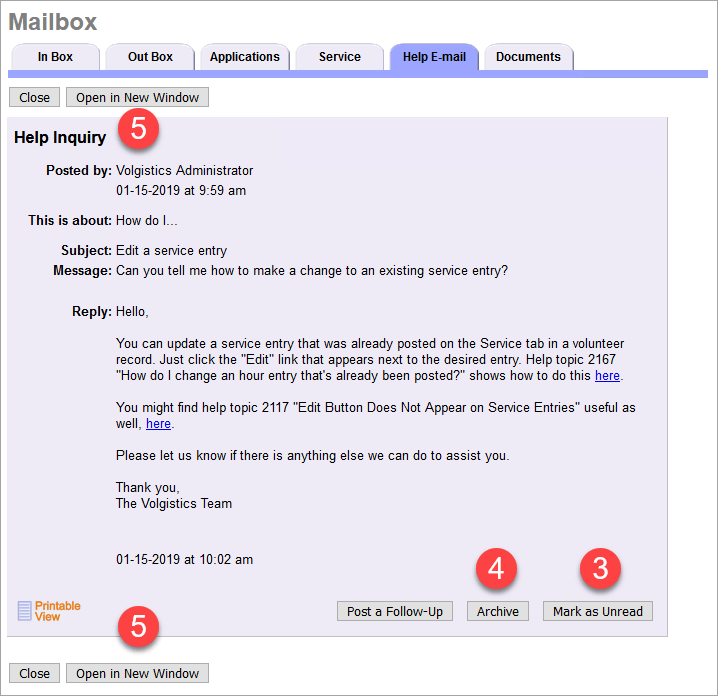 A volunteer management software can send your messages only to the volunteers who need to see them. Organize by schedule, assignment and many other factors for effective communication. Collaborative Scheduling: You have an opening, and your volunteer wants a shift. Meet both of your needs by posting a schedule that lets volunteers fill in open shifts with the click of a mouse. Reminders: Send manual or automatic reminders to your volunteers when they have a shift coming up soon. Hours Tracking: Coordinate your schedule with your time tracking to accurately count how many hours your volunteers work. Create a sign-in kiosk that lets volunteers clock in and out during their shift. Recurring Shifts: If you have volunteers with regular schedules, why take the extra effort to manually set them up? Let your software take care of repeating shifts and fill in the rest. You can look into the future and see what coverage you need without mentally adding your regular shifts to the calendar. Substitute Tracking: Make sure every shift has coverage by highlighting when someone needs a substitute and who takes on the shift. Keeping an eye on shift coverage also helps you determine if you need to talk to someone about adjusting their shifts. Sometimes, a volunteer doesn’t feel comfortable saying that they need a lighter schedule, so you can use these tools to see if they need assistance. Involving Meaningful Work in Every Position: Everyone wants to feel that they matter. Make sure your volunteers get to have exciting opportunities to break up the monotony. Scheduling and Announcing “Busy Work” Shifts: When you must assign less interesting tasks, let your volunteers know ahead of time. Giving them notice will also let them bring music or another way to make their work more engaging. Creating Incentives: Give volunteers a reason to come in for the day. If you have multiple people working on the task, promise a fun activity after you finish, like going out for food. Turn Monotonous Assignments Into Celebrations: Make repetitive tasks into an event. Set up snacks and music, and have fun while you work. If you regularly need volunteers to do this work, consider making it a monthly occurrence. Your volunteers want to feel appreciated for their work. Putting yourself in their shoes and listening to their needs will build trust and loyalty. For a volunteer, staying engaged means building an emotional connection to their work. How can they build that connection when you don’t invest the time and care they need? Tools like volunteer management technology will free up your time and energy to invest them in your team. When in doubt, practice gratitude and respect. They’ll go a longer way than you might expect. Volgistics makes volunteer management simple. You can use it to keep track of your team while you create and modify your engagement strategy. The price scales to your needs, so you only have to pay for the number of volunteers you organize. Feel free to contact the Volgistics customer support team for help understanding any features or sign up for a free trial today. We’ve released an update to allow deleted application forms to be recovered for up to 5 days from the date they were deleted. Are you ready to reach out to a local university? Engage a new group of college students by using these volunteer recruitment tips, and enjoy the spirit these young people bring to your organization. College students make fantastic volunteers. Their boundless energy and enthusiasm for causes they believe in can bring new urgency to your mission. They often have flexible schedules too, meaning they can work in those hard-to-fill daytime shifts. While some students have cars, most do not. Make sure you can either provide transportation for students, work with an organization to set up transport, or offer opportunities close to public transportation. It’s fruitless to find ways to get college students to volunteer if they can’t get to your location. College students want to secure good jobs after graduation, and they attend job fairs to network with potential employers. You can sign up for a booth at one of these fairs to meet dozens of students searching for new opportunities. Remind them that volunteering looks good on their job applications, though that should not be the only reason they assist you. Bring business cards and a small giveaway, like pencils with your charity’s name on them. Make sure to gather phone numbers and email addresses as well. On-campus church groups contribute time to various organizations in the area. Read up on the values and goals of each one to see what would be the right fit for your nonprofit, then reach out to the group’s president with a specific volunteer project in mind. The more details you provide, the greater the chance you can get a group of college students to attend. Professors often have close relationships with their students, who assist them with research projects or writing. If you work for an arts-related charity, for instance, contact someone in the theater department and ask how to recruit volunteers. They may have something like an internal electronic bulletin board where you can post an email chain for sending information. Sororities and fraternities are always looking for local charities to partner with on service projects. You can usually find descriptions of past projects on websites or social media. Look for groups that have pursued projects similar to yours in the past. Sororities and fraternities can supply large numbers of volunteers at once, so think about using them for a high-demand event. When you employ all these approaches to recruiting volunteers, along with any other best practices that you’ve developed, you should see an uptick in your volunteer numbers. If you need assistance scheduling volunteers or tracking security documents, consider using Volgistics’. Sign up for a live demo or contact us today to learn more about our volunteer management software. If your organization uses the VicTouch module, there may be times when volunteers arrive for duty and begin serving without remembering to sign-in. If this occurs and you find out before the volunteer leaves, you can easily correct this. First, have the volunteer sign-in through VicTouch. If it is not practical to have the volunteer leave their station to sign-in, you can sign-in for them if you know their PIN. This can be done at the VicTouch station or at your own computer. Our blog explains how you can briefly start VicTouch to do things such as sign-in for a volunteer. Once the volunteer is signed-in, bring up the Who’s Here page in your Volgistics account. You can click the Edit link to change a volunteer’s “Time in” to the time that they actually arrived. You can learn more in Help topic 2307. Organizations may want to track how many times their volunteers have served, rather than just how many hours they’ve served. Volgistics makes this possible with Service Measures. These are an ideal feature for recording special types of service performed, and can be easily configured to keep track of the number of ‘Shifts’ or ‘Visits’ that volunteers complete. To setup a Service Measure to keep track of ‘Shifts’ or ‘Visits’, you’ll start by selecting ‘Setup’, then choosing ‘Service tracking’, and clicking ‘Service measures’. Select any available measure to get started. Enter a name (such as “Shifts” or “Visits”), keep the Format set to ‘Whole number (0)’, enter a ‘Default value’ of “1”, and then click the ‘Save’ button. Once you’ve done this, re-select the Service Measure, click the “Make default value retroactive” button, and then click ‘OK’. This will update all existing service entries and setup all future service entries to count as “1” Shift or Visit. You can then include this data in many types of custom reports, such as custom Service Summary Reports or Service Details Reports, to obtain information on not just how many hours volunteers have served, but how many shifts or visits they have served. We’ve made some significant improvements to our help system. While this won’t change the rapid response time from the support team, or the accuracy or completeness of their answers, it does change how you’ll interact with them. First, when you log into Volgistics, you’ll notice that the menu has changed slightly. Instead of “Help”, you’ll see “Help Topics” where you can search through our documentation. You’ll also see “Support”, which will go right to the Help E-mail tab of the Mailbox. The Support menu item will also include a badge notification when you have unread responses from the support team. You may be used to having our responses pop-up automatically when they’re available. Because pop-ups are almost universally disabled, we’ve removed this feature in favor of the new notification. But if you still prefer to see responses in a separate window, you can launch one manually by clicking “Open in New Window” from inside the inquiry. We hope that these changes will make it easier to find the information you’re looking for in the documentation, and make communication with the support team more intuitive. Please let us know if you have any comments on these changes, or anything else in Volgistics. Many organizations are required to have an up-to-date W-9 form from companies that they do business with. For convenience, we update our W-9 form regularly and you can access it online. This allows you to save the W-9 form as a PDF document, or print a copy of the form without downloading it.